Anyway, back in my cringe-worthy high school days, I was an orchestra geek. Orchestra was a bright spot in a dark time. No matter how bad the rest of my life was, eighth period meant I got to play music and be part of something larger and far better than myself. Also, our urban public high school had no defined ruling class and a really great performing arts department. In 1975, music and theater faculty wrote and received a grant to create an original musical work celebrating US Bicentennial in 1976. 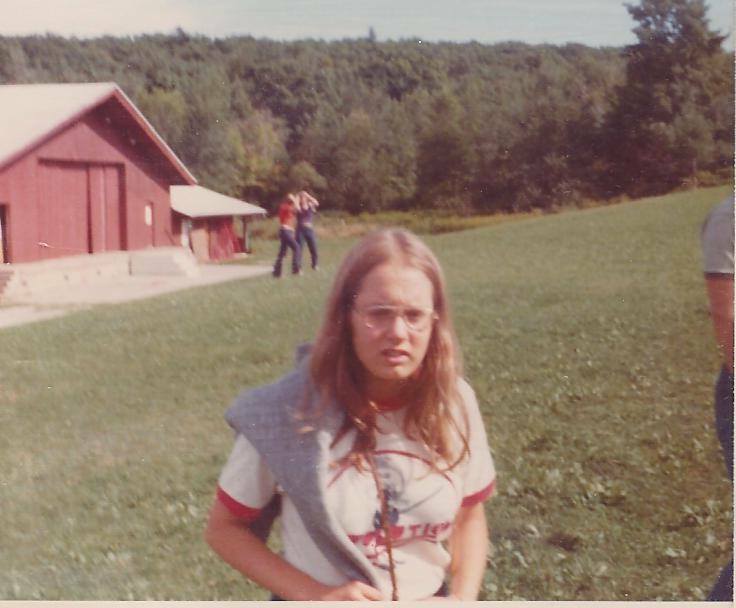 Me, in my “Revolution” T-shirt, during my cringe-worthy high school years. It’s probably more realistic to contemplate keeping 200 frogs in a wheelbarrow than trying to get a bunch of high school kids to write a musical. But Mr. Barone, Mr. Hanosh and Mr. Hebert (theater, choir & orchestra) and Mrs. Schmidt (dance – yes, our urban public high school had a dance teacher) pulled us together. Every Wednesday night that fall term we met in the orchestra room. Anyone who showed up was welcome to pitch in. My sister and I ended up with co-writing credits. My song was in the first act, hers in the second. I remember how jarring it was the first time I heard the brass section belting out the notes I’d been hearing as guitar chords. Our friend Jeannie wrote lyrics. Prodigies like Sam & Sar wrote music, lyrics and did their own orchestrations. Mike wrote lyrics and designed the logo, which appeared on the stage curtain and on the T-shirts we wore for performances. Joe worked on lighting and tech design. I could go on, but I won’t. Fast forward 40 years. Through a series of events I can best describe as serendipitous and confusing, I am part of a three-person planning committee with Jeannie and my high school stand partner, John. Along with ex-officio members Mr. Barone & Mr. Hebert – now Bob & Ron – we are in the midst of planning a Revolution Reunion this coming summer. In the spirit of our high school, we’re throwing it open to anyone who was part of the performing arts department, whether or not they were in high school for that show. I don’t remember when I last spent more time laughing with other people while getting real work accomplished. The three of us haven’t interacted in any meaningful way since high school. So it has been a joy to discover how much we still like each other, how compatible we are as a work team and how closely aligned our ideas and expectations are for the reunion. We’ve been meeting via Skype on a quasi-monthly basis across three different time zones (Pacific, Central & Eastern) since October. We bought a domain name and John (a professional web designer) created a splash page. We wrote a letter and designed a survey. Bob locked down a location, and we’re now collecting data – via survey – on how many people to expect and what sorts of activities other than the afternoon event we’ve taken on people might want to see occur. For me, though, the best part of the reunion has already happened. Call it one of life’s minor miracles. Or some sort of reassuring sign from the cosmos that maybe the world isn’t a completely terrible place. Which, based on my experience, is what happens when you suddenly reconnect with people you liked a lot in your teens and they turn out, in your fifth decade, to be people you like even more now. Someone’s probably coined some snappy one-word definition to sum up that feeling. But I’m old school. So I’m just going to say that being on Skype with John and Jeannie is a non-stop flight to that zone where nothing bad can touch you and your next big laugh is never more than 30 seconds away. Pretty cool, Amy. Thanks for sharing!